Three months ago, the Zimbabwean military intervened to replace Robert Mugabe – the country’s long-time leader – with the former vice-president, Emmerson Mnangagwa. Long one of Mugabe’s top allies, Mnangagwa is a controversial figure in Zimbabwe. By JOHN SIKO. As state security minister in the 1980s, he was in office during the Matabeleland massacres that killed as many as 10,000 ethnic Ndebele in an effort by the ruling Zanu-PF to crush political opposition and consolidate power (although he denies any direct involvement in the killings). Throughout the 2000s – a period in which Zimbabwe struggled with state-led political violence and saw a near 40 percent decline in its economy – Mnangagwa held several senior positions (including defence minister and speaker of parliament) in which he was instrumental to the state’s decision-making processes. Hence, it is easy to dismiss his ascension as a case of old wine in new bottles – or as one opposition figure told us during a recent visit to Harare, ‘an old snake in new skin’. After spending a week in Harare in late January, however, and meeting with dozens of contacts from across the political spectrum, our belief is that the ‘more of the same’ narrative is too simplistic to capture what has really happened in Zimbabwe. The Harare we visited was alive with optimism about the prospects of badly needed economic reforms and re-engagement with western donors after elections that are expected to take place in July. Zimbabweans from across the political divide – even long-time Zanu-PF antagonists – indicated their willingness to give the new president a chance to turn the country’s economic fortunes around. And investors, already flocking to the country in search of opportunities at bargain prices, are keen to enter the market, although with a scepticism stemming from two decades of Zanu-PF economic mismanagement. Zimbabwe is far from being out of the woods yet; the election in particular will be a key test of whether the new government is committed to legitimising its rule at the ballot box in a free and credible fashion. Western governments have strongly and rightly signalled that there will be no significant re-engagement until this happens. In addition, the government has a mountain of economic reforms it needs to make, both before and after elections, to restore investor confidence and really get the economy moving. But the degree to which business people, politicians and external investors were confident that these steps would happen was striking, particularly for a country that has seen little optimism in the past two decades. The optimistic attitude we encountered in Harare was not just a matter of wishful thinking or blind acceptance of the government’s reformist rhetoric, although its promises of economic reform – in some cases radical – are certainly welcomed by the business community. The talk of change we heard throughout the trip was indeed impressive, and in some cases quite radical. Several leading Zanu-PF officials said they wanted Zimbabwe to be the “Singapore of Africa”. The ideas we heard bandied about were structurally significant: special economic zones, low taxes for early entrants, a true one-stop shop for international investors, and many others. On top of that, there were promises from all quarters that property rights and the rule of law would be respected in regard to both local and foreign investment. That said, there was a willing acknowledgement that the government would have to build up trust, given events of the past 20 years. Words are good; deeds are better. And on this front, the government has already taken several steps to show investors and the Zimbabwean people more broadly that things have changed. The streets of Harare were the first proof; virtually all of our interlocutors told us that unlike three months ago, they were not thronged with police seeking bribes from motorists. Mugabe’s police commissioner had given officers free rein to shake down motorists – as long as the bribe money was kicked up to the police top brass. This resulted in checkpoints all over the capital and the country; one contact told us he had passed almost two dozen on the road to Gweru, a 270km trip. However, immediately after Mnangagwa took over, the police were ordered to stand down. Such a move was hardly radical or controversial, but it was tangible proof that the government was taking steps to differentiate itself from its predecessor. Gazetted changes to the Indigenisation Act that will leave only platinum and diamond mining subject to 51% stakes being reserved for Zimbabweans; this is expected to be passed by parliament in the next month;? Revised the terms of 99-year leases to do away with provisions that allowed the government to push leaseholders off the land with 90 days notice, a move to make them bankable and transferable; and? Fired 3,700 youth commissars – essentially Zanu-PF thugs employed by the government – and 500 civil servants without correct qualifications, while announcing the mandatory retirement of civil servants over 65. Obviously there is much more to do, but in fewer than 100 days, these are impressive accomplishments. Also, beyond policy reforms, we were regaled with several stories from our contacts about how the business environment has improved. Long-contested tax penalties were being settled. Civil servants, under pressure from the top, were answering phones and dealing with outstanding issues. And local businessmen and international investors alike are getting access to ministers, and even the president, to air their grievances – and in several instances getting changes they asked for. Put together, both words and deeds are fuelling the optimism so rampant on the ground. Throughout our visit to Harare, we were frequently shocked at the degree to which representatives of Zanu-PF – a party that spouted Marxist-Leninist rhetoric right up until Mugabe’s departure – were now sounding like centre-right believers in a liberal economy. When questioned about this, our counterparts laughed but promised that the new pro-business line was a reflection of what they and Mnangagwa really believed. They were quick to blame the country’s ills on Mugabe, and his wife Grace, who was derided as the ultimate kleptocrat and a corrupting influence on her husband. Mugabe himself was still spoken of with reverence, as a socialist true believer with no understanding of the private sector who led the country down a wrong path. One top official close to the former president compared him to a chicken farmer who “would give away the eggs to the poor and ask donors to fund the feed”. However, when asked why they did not step in while Zimbabwe’s economy was imploding, our Zanu-PF contacts endorsed the narrative that Mugabe was simply unchallengeable while president. 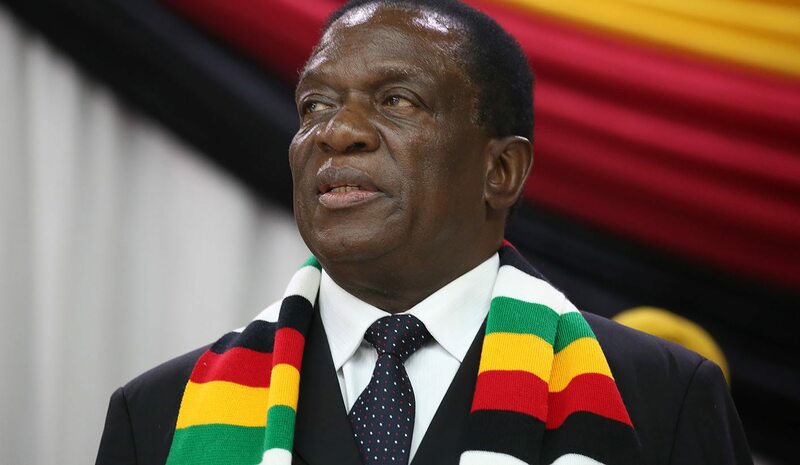 “No one could stand up to the old man” in cabinet or Zanu-PF structures, one said; he was simply an unassailable figure from a political standpoint, and even the military intervention was motivated more by the desire to sideline Grace rather than oust the president himself. As with the “more of the same” narrative, this does not ring true; self interest was as much a motivating factor as fear in the inability to challenge Mugabe. But for Zanu-PF, this is a convenient party line to push to the international community – “we are all free marketeers at heart; the old man held us back”. Still, the consensus view in Harare is that the assessment of Zanu-PF principals as being business people at heart is largely true, even though many are more crony capitalists than true free marketeers. And all of our contacts viewed Mnangagwa much in this light. The president is a rich man – perhaps the wealthiest in Zimbabwe – and has an array of business interests ranging from farming to mining to property development. The extent of these interests, and how he acquired them, is not entirely clear; Mnangagwa has called for government officials to declare their assets, although he has yet to do so himself. But those who know him painted a picture of a savvy investor and businessman who understands how the free market works and is focused on facilitating rapid economic growth. He is apparently fond of the aphorism “capital chases returns”. Several times during our visit, we were told by contacts close to Mnangagwa that he personally seeks to emulate Deng Xiaoping (the man who transformed the Chinese economy) in his governance of Zimbabwe’s economy. They said that one of his favourite sayings is Deng’s: “It does not matter whether the cat is black or white, as long as it catches mice.” Mnangagwa is a pragmatist at heart. Given the still perilous state of Zimbabwe’s economy, he knows that an investor-friendly environment is the only path to meaningful growth. Few of the reforms and ideas we heard mooted by Zanu-PF were radical, with most – like the steps needed to revitalise the agricultural sector – premised on simple common sense. That said, Deng was no democrat, and the now 38-year rule of Zanu-PF also shows the party has little affinity with the concept. There is no question at this point that Mnangagwa will win the upcoming election, and the only question among our contacts was whether Zanu-PF will win a two-thirds majority in parliament. While there is genuine enthusiasm for Mnangagwa’s promised reforms, this is not the reason why he and the party will win – it’s fatigue. Zimbabweans want this election to be over so the country can move on, as donor re-engagement cannot happen unless the polls are considered free and fair by international observers. Will they be? Almost surely. The voter registration process is thus far going smoothly (even in the eyes of otherwise sceptical observers), so Zimbabwe is unlikely to encounter the voter roll problems that have plagued past elections. The government has promised full transparency for international observers, and further promised that violence and intimidation are a thing of the past. But the real path to victory lies around a hopelessly divided opposition. Even before the death of long-time opposition leader Morgan Tsvangirai (who had been gravely ill for months) on 14 February, his party, the MDC, has been on the verge of splintering. Several other parties and movements have sprung up across the ideological spectrum, none of which have any real chance of competing and several of which are likely to divide opposition parliamentary votes. This will allow Zanu-PF a chance in districts where it previously had none. So Zanu-PF does not need to take drastic actions this time around; two decades of violence and intimidation combined with a breakdown in opposition leadership have more or less guaranteed it a victory. So what does this all mean for investors? We have worked on Zimbabwean political issues for several years, both as analysts and diplomats. The changes we saw in Zimbabwe truly were astounding compared to past years. The mood was different; people were legitimately upbeat. Government ministers and bureaucrats who would not give Westerners the time of day six months ago were going out of their way to speak to anyone even hinting at investment opportunities. As noted earlier, both rhetoric and action were moving in a positive direction. Optimism, therefore, is justified. Zimbabwe, however, does not have a great track record of keeping its promises in recent years. Assurances to protect property rights are one thing, but following through on them is quite another. There will be many dilemmas. Cutting public spending and retiring bureaucrats sounds straightforward, but there will be political and patronage considerations to take into account that could be problematic if the government moves too fast. This is particularly true for Zimbabwe’s more than 120 state-owned enterprises and commissions: most serve no real purpose and pose impediments to investors, but the government has used their top jobs to place veteran party cadres or retired military officers. Opening up investment to outsiders is another potential problem; such a move would spur growth, but how does the government ensure that local (politically connected) partners are still involved?